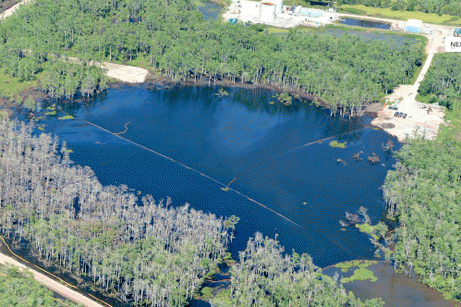 This update is the 18th article in this Opednews series about the Bayou Corne sinkhole. BACKGROUND: In Spring of 2012, Louisiana's Corne and Grand Bayou residents noticed strange bubbling in the bayou for many weeks, and they reported smelling burnt diesel fuel and sulfur. Suddenly a sinkhole the size of three football fields appeared on Aug. 3, swallowing scores of 100-foot tall cypress trees. The sinkhole resulted from the failure of Texas Brine Company's abandoned underground brine cavern. The Department of Natural Resources issued a Declaration of Emergency on Aug. 6, and 150 families were evacuated. For maps, diagrams and additional information, please see the seventeen previous installments in this series, listed at the end of this article. NAPOLEONVILLE, LOUISIANA: A portion of the berm around the unprecedented sinkhole in Bayou Corne, built to keep contaminated water from the sinkhole from seeping into the surrounding bayou area, is now underwater. On Monday June 4, about 400' - 500' of the berm apparently sank approximately six feet. Some residents who have stayed through the ordeal since August 4, 2012, are now leaving. The Bayou Corne sinkhole disaster is an unprecedented event. Therefore no one has past experience with a sinkhole of this magnitude, so there is no previous experience that might direct activities toward containment or effective resolution. View All 32 Articles in "Bayou Corne Sinkhole"